The fabric is now all washed and pressed. Some of you might ask, why I wash and press my fabrics. That is a great question! There are several reasons why I do, especially when I have the time..
1. The colors that will bleed will do it before they get into the quilt. I throw a Shout Color Catcher (get a free sample here) in the wash with them and they work fabulously to remove any excess dye. 2. To remove any of the sizing that is in the fabrics. This I like to do for a couple of reasons, if it is for a baby quilt or a pillow case especially, I like all the chemicals to be gone. The other reason is that I think that the quilting looks nicer on fabric that has been washed. I am not sure why, maybe the fibers in the fabric are now more fluffy causing the quilt stitches to look nicer... I am not sure, but it sounds good right?? Sometimes, if I am working on a deadline it is just not possible to wash and iron so it has to wait. But my preference is to wash and press. 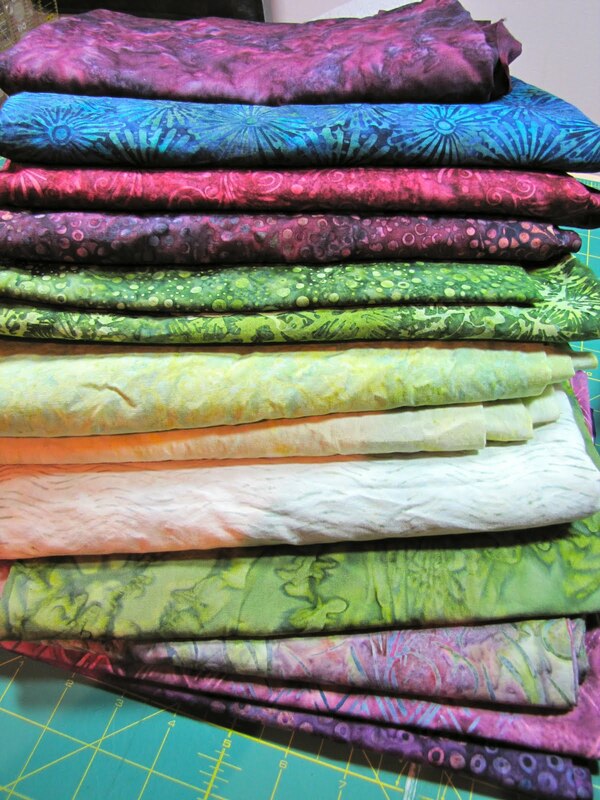 Do you wash your fabric or not and why?? 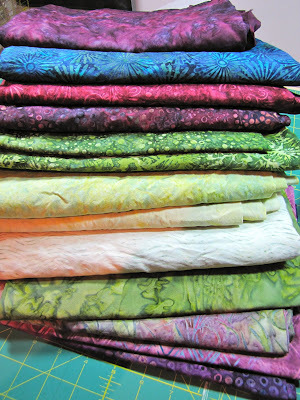 All these batiks that I chose for a second project are in need of a good pressing! Any takers??? LOL!